INSTRUMENTAL, VSQX, MIDI, AND OTHER FILES NOW AVAILABLE https://app.box.com/s/bpmi1qz2nw7srlixu9i1xs98b8avdum4 VSQX has been stripped of most tuning, sorry Alright, let's get stuff out of the way. Plain and simple: I AM ACTUALLY NOT HAPPY WITH HOW THIS TURNED OUT, but I did want to churn it out for the contest because it was the perfect opportunity for me to introduce a sequel to my first released original "Metropolitan Irony" which was released on the first Miku Expo song contest. I promise, though, that I will remaster this and make it better! Nonetheless, I still wanted to release it because of three factors. First, as aforementioned, it is a sequel to my last Miku Expo song. I know that sequels aren't likely to win, but frankly I don't think I have a shot at it anyway LOL. Second, my IRL friend Chidl created art for the cover WHICH IS REALLY LOVELY, SHE IS AMAZING, SHE IS PRECIOUS. Thank you SO SO much, Chidl, for putting in so much effort and for believing in me! Third, I also joined because I wanted to teach myself how to stop caring too much about satisfying myself to the fullest extent, and instead treating myself as a work-in-progress that needsa all these little practices and products in order to improve not only my skill, but also my self-esteem. (Honestly, I think I'm failing...) Aika Anno, who tuned Metropolitan Irony, helped me tune this song, but the melody was rather challenging. Add my lack of mixing skill and - voila! - I make myself Disappoint™️. But thank you so much, Aika! We both tried our best even though tempo and my bad mixing ruined things... Speaking of why I couldn't just remake the whole thing from scratch before submitting, here's the thing: I STARTED MAKING THIS ABOUT A WEEK BEFORE TODAY, which happens to be the deadline of the competition (January 31, PST). I did some experimentation the week before that, but this mostly took shape in the past week, and it was SO RUSHED. Not to mention, this is the FIRST song I completed with Cakewalk SONAR, which I got free with a magazine! I'm aware the DAW is discontinued, but the reason why I like it is that the fairly intuitive UI, mature (if dated) code base, and the good workflow mean that I can finally make music on my Windows laptop instead of my dying Mac! I've been teaching myself Sonar and this is my first big project with it; I'm so happy I can finally sidechain and fix the issue with the kick in my previous songs! Any feedback would be appreciated; you can also PM me for detailed critique. Thanks, and I hope you enjoy or at least can tolerate! 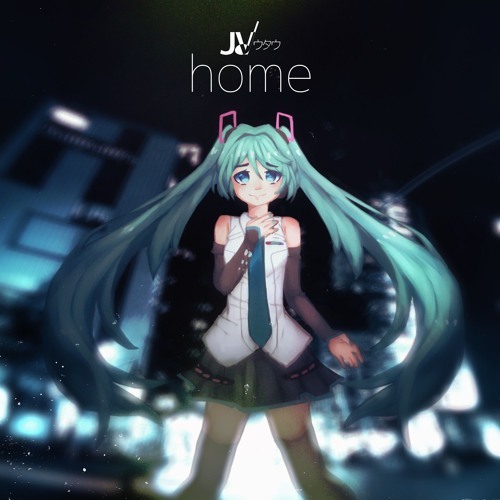 Home Vocals by 初音ミク (Hatsune Miku) Music, Lyrics, Tuning by JVウタウ Art by Chidl (anonymous) Tuning assistance from Aika Anno - STORY - “Can I finally find a place called home?” - Hatsune Miku, 2015 Once upon a time, I was drowning, not in water, but rather in the sea of questions that accompany identity. Now, I've emerged from the depths and could finally breathe, if only barely. I want to help you reach the surface. - LYRICS - They're long, so I can't place them here now. https://docs.google.com/document/d/1iXVa6gVQt_NRjk0hxaAB2jxXp39fYcBjSE_tEMo9Sok/edit?usp=sharing - TECHNICAL ASSETS - The following effects were used: Cakewalk Sonar effects, TDR Kotelnikov, Melda Production plugins, Sanford Reverb, Reverberate CM, Krush, and a couple others (will update when I remember) The following virtual instruments were used, in rough approximation of how much they were used: AIR Hybrid 3, Cakewalk Rapture Sessions, Grooove CM, Native Instruments Komplete Players, AIR Xpand!2, Alchemy Player CM, Piano in 162, DSK HQ instruments, NES VST, u-He Tyrell N6, Magical 8-bit Plugin I also used many samples, including drum samples.